Nanzen-ji (lit. "Southern Zen Temple") is the head temple of the Nanzenji school of Rinzai Zen Buddhism and is the presiding temples of the Kyōto Gozan (京都五山), the "Five Great Zen Temples of Kyōto". The five temples in question are, in order of rank, the Tenryū-ji, Shōkoku-ji, Kennin-ji, Tōfuku-ji, and Manju-ji. 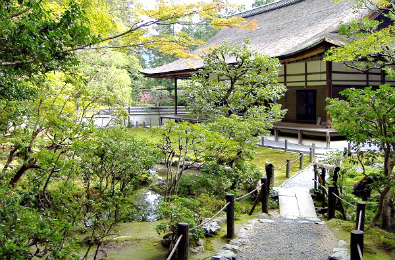 Nanzen-ji is above this ranking and was bestowed the title of "First Temple of The Land". Its formal name if the Zuiryūsan Nanzen-ji (瑞龍山禅林寺). 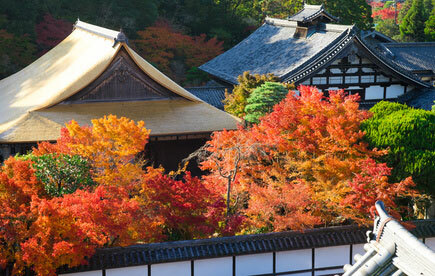 Nanzen-ji is listed as a UNESCO World Heritage Site. The vast complex of 12 Zen temples revolving around Nanzen-ji is one of the most touristy area of Kyōto. The prime attractions are its rock gardens and fusuma paintings in the Hōjō. Two of the subtemples serve Buddhist vegetarian cuisine (shōjin-ryōri). Nanzen-ji was first established in 1264 as a villa for Emperor Kameyama (1249-1305), a particularity shared with Tenryū-ji. In 1274, the emperor abdicated in favour of his son, Emperor Go-Uda, but kept exerting power and influence behind the scenes until Go-Uda's own abdication in 1287. Shut out of the political stage by the Kamakura shogunate, Emperor Kameyama entered the priesthood in 1289 and became the first Japanese emperor to embrance Zen Buddhism. Two years later he invited the priest Fuson and helped him establish the Nanzen-ji Temple in his retirement villa. The temple was originally named Zenrin-ji (禅林寺 ; literally "Zen grove temple"). The emperor resided in the upper palace, while Fumon taught the precepts of Zen in the lower palace. The upper palace later became the Nanzen-in subtemple. The temple suffered considerable damage in a fire in 1447, and most of the buildings were destroyed again during the Ōnin Wars (1467-1477). As a result, most of the present structures are later reconstructions, chiefly from the 17th century. In its heyday during the Edo period (1603-1867), Nanzen-ji was composed of 62 subtemples. The Meiji government (1868-1910), favouring State Shintoism over Buddhism, aimed to drastically reduce the importance of Nanzen-ji, closing or severing off most of the subtemples. The massive, 22m-tall San-mon Gate was built in 1628. Go up to the second floor (entry ￥500 ; 9am-5pm) to contemplate one of the most magnificent view over the city. It is one of Kyōto's three great gates, along with the San-mon Gate at Chion-in Temple and the Goedo-mon Gate at Higashi Hongan-ji Temple. The Hōjō (方丈 ; Abbot's Hall) was converted into a museum (￥500 ; 8:40am-5pm) to display the temple's treasures, including fusuma screens painted by Kanō Tanyū (1602-1674) and other members of the Kanō school. 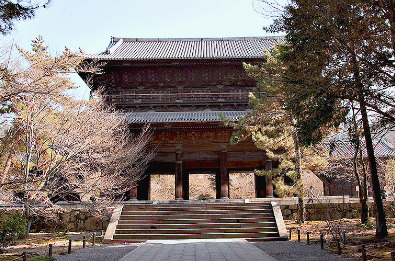 The Hōjō is actually made of two buildings, the Daihōjō (large hall) and Shōhōjō (small hall). The Hōjō grants access to another prominent karesansui (rock garden), the Leaping Tiger Garden (虎の子渡しの庭 "Toranoko-watashi-no-niwa"). 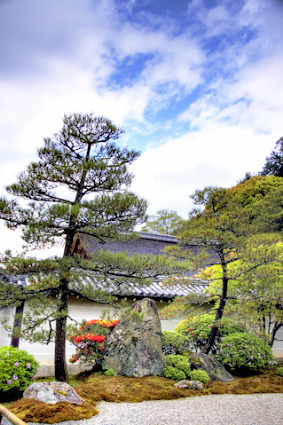 The garden is believed to be the work of Kobori Enshū (1579-1647), who is also credited for the garden designs of the Sento Imperial Palace, Nijō-jō Castle, Kōdai-ji Temple and Katsura Imperial Villa, among many others. This is one of Kyōto's best-known rock garden scene: three large stones depicting the tigers, and three small stones representig the cubs, ready to leap across a river, here symbolised by the fine white gravels artfully raked in patterns evoking the flowing of water. Among the several sub-temples' Zen gardens, those of the Nanzen-in, Tenju-an and Konchi-in stand out as the most attractive. The Konchi-in (金地院) possesses another dry garden attributed to Enshū, possibly one of the finest in Japan. Konchi-in started as an independent temple in north-west Kyoto and moved to its present location when it became affiliated with Nanzen-ji in 1400. Destoyed during the Ōnin Wars, the temple was rebuild in the early 1600's. The Kara-mon Gate was added in 1628 as a memorial to Tokugawa Ieyasu and a branch of the Tōshō-gū Shrine. Also on the grounds are a tea house, a pond with an island, and an apparently misplaced Shintō shrine (in a Buddhist temple) in the backdrop. 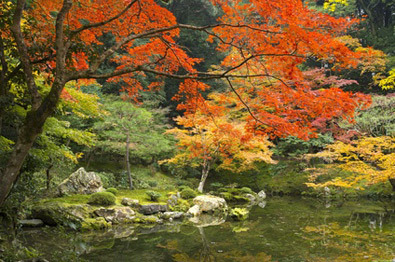 The Tenju-an (天授庵), has two renowned gardens of its own. The relaxing water garden (or "south garden"), distinguished by two waterfalls and two ponds with white stepping stones, is completed by dry garden (or "east garden"). It is only open in spring and autumn. The Nanzen-in (南禅院) is the oldest, yet one of the less frequented subtemples. It started as a retirement villa for Emperor Kameyama, and was bequeathed to Nanzen-ji in 1291. It contains the mausoleum of Emperor Kameyama, as well as a quiet moss garden with a pond surrounded by momiji trees and azaleas. The pond has several tiny islets, including one shaped like the Chinese character for "heart" (心). The location of the Nanzen-ji compound at the foot of the Higashi-yama Hills is part of its charm. Behind the Nanzen-in is a 93m-long brick aqueduct (水路閣 "suirokaku") built in 1890 as part of the canal used to bring water from Lake Biwa to Kyōto (see also Philosopher's Path). It has a distincly ancient Roman look, attributable to the permeating influence of Western culture on public constructions of the Meiji period. The aqueduct leads to a small Shintō shrine and a waterfall, well concealed in the depth of the lush woods. A track continues in the hills to the Daimon-ji Temple (about two hours walk). Nanzenji is open all year-round from 8:40 am to 5:00 pm (until 4:30 pm from December to February). A separate admission fee is charged for the five main temple buildings: ¥500 for the Sanmon Gate and Hōjō, ¥400 for the Konchi-in Temple and Tenjuan Temple, and ¥300 for the Nanzenin. 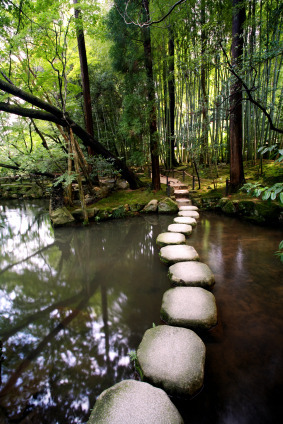 Nanzenji is easily accessed on foot from Heian Jingu, Chion-in or Ginkakuji. From Kyōto or Sanjō station take bus No 5 and get off at Eikan-mae.